One day a few weeks ago I had a day to kill with one of my two multivariable calculus students. So I decided to talk a bit about something which intrigued me when I first learned about it. What about the cubic? quartic? quintic? higher? I then asked if we could, for any coefficients, find all zeros (real or complex) to the polynomials. Then I asked about the cubic. He said he knew how to find the solutions to some cubics. Like he could graph them and if they hit the x-axis three times, he could get the solutions. Not good enough. We wanted formulas for the solutions. For any coefficients. Without graphing. Like we had for the quadratic. He (naturally) said he didn’t know. So there is a formula. And it’s messier than the quadratic, which is messier than the linear . So we checked the quartic. And indeed, SAGE found a solution. I’m only copying the first few lines here since it goes on forever. So here we are, and there’s a pretty good chance things will continue — there’ll be a solution but it’ll be more and more complicated as the polynomial degree gets higher and higher. Um… it won’t solve it for us? Is SAGE just not powerful enough to help us? Do the solutions get *that* much harder? But it isn’t that SAGE was broken. It turns out there is no “formula” to get the zeros of any given quintic or higher polynomial. 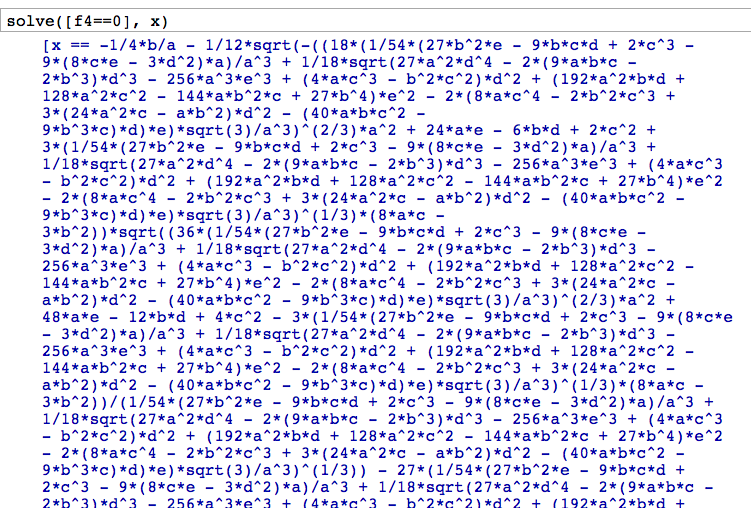 Sure, you can solve some quintic polynomials. Heck, they might even be factorable to or something. But that isn’t what we’re asking. We’re asking if you have any quintic (or higher) polynomials, can you come up with an algebraic formula for the exact roots. And the reason I wanted to show my student that is because it was learning that fact in high school, the insolvability of the quintic, that got me even more interested in math. It raised the huge question: what broke down after 4? Why is 5 the magic number? Is it truly impossible for any degree polynomial greater than 5? How can anyone show that a degree 1021 polynomial won’t have a “formula” solution for its zeros? No one could explain it to me, but my math teacher swore it was true. It seemed so crazy to me! Heck, it still does. Interesting tidbits like that lit a fire under my feet  to take college level algebra (Abstract Algebra) to help me understand it. It was one of the most glorious days of college when in our Abstract Algebra class we finally got to tackle and solve this problem. Do I remember how we did it? Sigh. No. I have Flowers For Algernon syndrome. But I at least know that the solution is out there, and given enough time and patience, I can understand it once again. I doubt my student got out of it the same level of “WHAT THE HECK? !” as I did, nor do I think it lit the curiosity fire under his feet. But heck if I didn’t show him that our intuition breaks down without cause sometimes, and there are answers to be found. Maybe not in our class, but in some other class if he ever wants to solve the mystery. Well, when I was in high school, I had my dad’s worn, cover-falling-off CRC Book of Mathematical Tables and Formulae. In it was the solution of how to solve any cubic, and how there is indeed a formula (like the quadratic) for the cubic. (You can see it nicely typed here.) I suspect it also had a paragraph or two about the Cardano/Tartaglia dispute. Godel’s incompleteness theorem was another one. One of the ideas that always blows away my students, especially the international ones, is the idea that there are integrals that cannot be solved by hand. Taking derivatives seemed so simple, why couldn’t be as easy to go the other direction? I then share with them the Navier-Stokes equation, a differential equation that has a one million dollar prize if it can be solved. This inevitably gets us talking about the Millennium Problems. At the end of the year, we usually have some sort of student presentations about interesting mathematical problems, and the Millennium Problems are usually well represented. I know I found these problems amazing when I was in college. The existence of a challenge to solve a problem, knowing that there were mathematicians that might have spent their whole career working on one problem and not being able to solve it, was amazing. In high school, students have no idea what a mathematician does but any wonderment of this type can help give them a glimpse at the real beauty of math. Oh, that’s such a cool idea, for seniors! How do you have your students find these problems? And I guess more importantly, how do you get them interested in learning about them? (How) do you grade them? How do you get the presentations — one after the other — from getting boring? As for the N-S equations, I actually recently just posted about them! Coincidence! As to the question of how I get my students to find these, I usually have talked about a lot of different open or important questions during the course of the year and most of them have already had their interest piqued by one of those. For those that have no idea what to do for a project, I send them to the Millenium problems. Here is the presentation rubric that I usually use. I like to tell my students that the key to a good presentation is that you know more about the subject than you plan to talk about. This a statement that they understand and can relate to. As to what they are presenting about, it depends on their problem and I sit and talk with each of them about it first. Sometimes, they just give a history of the problem, what type of math is needed to understand the problem, and the applications of its solution. If the problem is easy enough to understand, they can actually talk about the problem in detail, such as my student who presented on the three problems of antiquity. One time, I had a wonderful presentation given on the Riemann Hypothesis that went into the basic mathematical background of the problem. Not all of the presentations are always wonderful but I’m just happy to have my students see that real mathematics is so much richer and intriguing than what they have experienced in high school. Although this is probably the part you remember, here is the quick and dirty answer to the question: Why is there no general formula for a quintic? To every polynomial, we associate a group, called the Galois group. The polynomial is solvable (that is, there is a formula for its root in the sense of your post) if and only if the corresponding group is solvable. The Galois group of a polynomial of degreen n is isomorphic to a subgroup of Sym(n), the symmetric group on n letters. As Sym(n) has n! elements and the smallest non-solvable group has order 60, every polynomial of degree less than or equal to 4 is solvable (of course, we knew that because there are explicit formulae). However, for any n, there exist polynomials whose Galois group is Sym(n), which is not solvable for n >= 5. In particular, the general quintic is unsolvable. Probably the most famous example is due to Van der Waerden: f(x) = x^5 – x – 1. Your explanation is so clear! I’m jealous that I’m not taking an Algebra course under you. I, sadly, don’t remember anything about Galois groups — except that there is something called a “Galois group” — but I was so inspired to remember this stuff that I searched and searched and dug out my blue Artin Algebra book (which I never formally used, but I bought). Of course, by the time that I found it, I was winded and fell asleep. Ha. This is one of my favorite results — I still don’t believe it at times, even though I know it’s true. My students have the same reaction sometimes when it comes to trisecting an angle with a straightedge and compass: it ought to be possible, and the idea of proving that it’s impossible is really rather amazing. So not only did Galois prove that when the degree is at least 5 there is no general formula, he also gave a way to decide — for any specific polynomial — whether there is a way to express its roots using radicals. Thanks for showing me how to do more in SAGE, and the additional info! I have found exact 5 solutions for the quintic equation a x^5 + b x^4 + c x^3 + d x^2 + e x + f = 0 with the help from Cardano’s cubic formula and Ferrari’s quartic formula.